There is a long narrow strip left to develop and I have decided to build some sort of oil refinery there. Currently it has a poorly made grassy bank hiding the gap at the back of the baseboard. But I have now filled that with the thin MDF strip wood used to widen the mainlines around the edge of the room. The lorry is a base models tanker, the upright tanks are drainpipe sprayed aluminium. There will be just enough room to put a low wall front and back of this part to separate it from the backdrop and the mainline. The siding is modified with a double half curve to add interest and lengthen that spur for shunting. A piece of the dividing wall has been built and is shown in the bottom right of the picture above. The addition of pipework to connect tanks and feeder pipes for the tank wagons is now in place. I have also added an isolation switch at the end of the spur so that a shunter can rest in the shed. I envisage purchasing a dock shunter and converting to to 3 rail for this purpose. Here is a better view of the same. 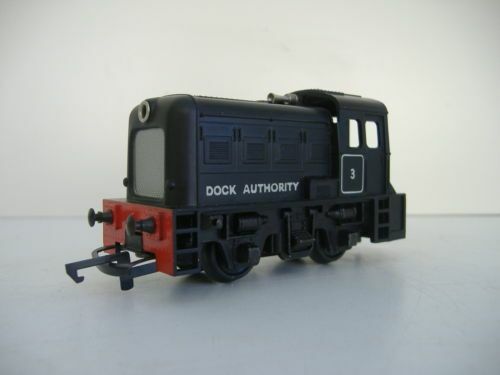 To complete the terminal I've just purchased a 2 rail Dock Shunter. I will be converting this to 3 rail complete with 3 rail couplings and using it to shunt tankers in and out of the terminal. I'll give a blow by blow account of how to do this in a short while. The loco arrived today and having stripped it down and cleaned it, the following are identified. This is the later version it has no ribs on the wheels. This was assumed to make it sound like a diesel, but this is better for me. Also the axles are isolated on one side to collect power from one track whilst the other is collected through the body. I'm assuming that if I reverse one of the axles when the conversion takes place I will be able to collect from both outside tracks through the body. Next to replace the bulb with a red LED. The beauty of this is it can be used directionally so that it only lights when the loco is driving forward. A coupling has been fitted to the front and an ordinary one bent with a dogs leg is about right. The same will be one to the rear but that fits to the body. Here it is at work. Just the right size for the siding! Using Ratio set 530 each giving two tanks on a base.